So often we make haste and impulsive decisions when our emotions are highly revved up. At times we make decisions when we’re extremely happy and think the ideas formulated during this happy state seem like the best idea ever or decisions we make when we’re angry that we end up lashing out at those we love by saying and doing things we would only regret later. I know I’m guilty for impulsive decisions but as I’ve made these decisions, I try to throw in some rationality. Some ideas look great on paper but when I’ve tried to execute them, I find that the idea just wasn’t the best idea ever. What I’m NOT saying is that we should NOT try. The emotional state we are in during the time of decision is somewhat temporary and our minds are clouded by pure emotions, not an ounce of rationality. All you need to do is take the time to let our emotions settle in. 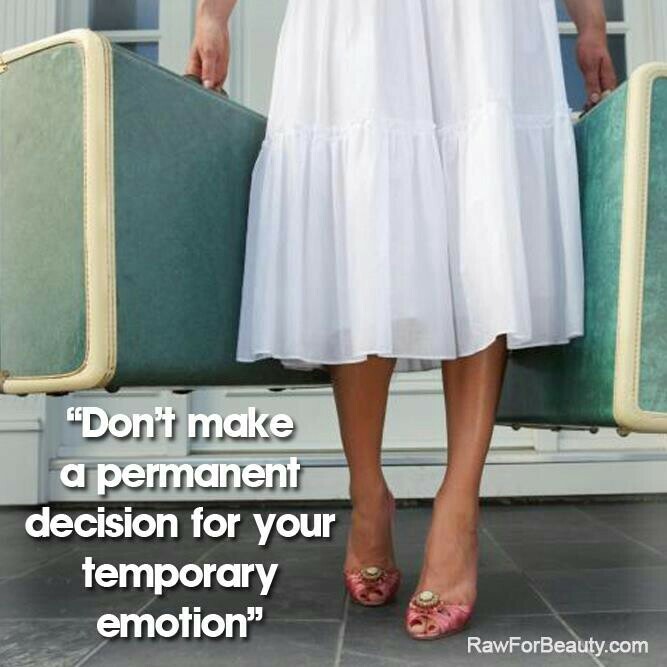 On the other hand, don’t take too long in settling in the emotions that you just don’t make a decision at all. Often in relationships, we are so quick to end relationships during arguments and fights (of course there are certain boundaries that call for an immediate end, proceed with caution) because of the high emotions of hurt, pride, and anger. Often in our careers, we often STAY in unhappy and unfulfilling positions because of the temporary fear of job security (yes, not everyone is able to quickly leave secured jobs for personal, financial, or family reasons). Point being, just let your emotions marinate and shift through the feelings that cause you to even consider making those particular decisions. Don’t pack your bags unless you’re truly ready to leave.